Affectionately referred to as the Windy City, Chicago sits on the southwestern shore of Lake Michigan and is one of America’s largest cities. With its skyscraper-filled skyline, diverse culture, and wildly popular sports teams, Chicago and its residents have a no-nonsense, say-it-like-it-is, stand-up reputation that prizes hard work, honor, and determination. 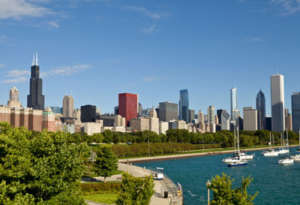 A magnet for business (from manufacturing, shipping, and finance to healthcare, technology, and retail), Chicago has produced countless successful entrepreneurs and attracted wealthy families from all around the world. For decades, Pavillion Agency has provided an unmatched level of domestic staffing services that Chicago’s elite have come to rely on. What sets Pavillion apart? We are a one-stop shop for household staffing solutions. Our agency offers job placement services (permanent, temporary, or temp-to-perm), payroll processing, benefits consultation, and in-home staff training. Let us show you the Pavillion Agency difference!